A DapperLads Design, this white linen knicker set with navy accent wear is formal and fresh for summer weddings, christenings, cruising, or photo shoots. 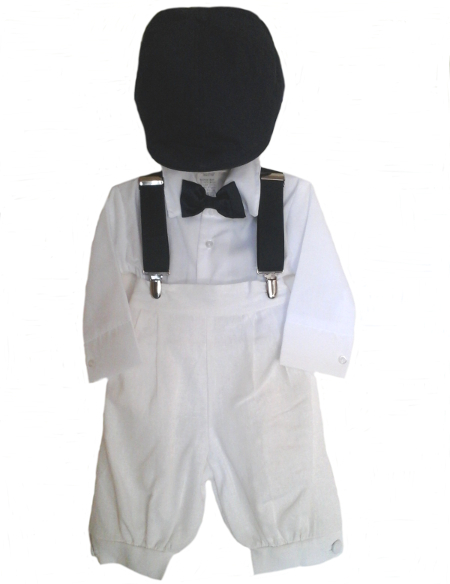 The 5-piece set includes white linen polyester knickers with an elastic back, a 65%-35% cotton-poly blend long sleeve white shirt, a navy silk clip-on bow tie, navy suspenders, and a navy French Driver cap with elastic in the back. The outfit runs fairly true to size however we have had some comments that they are a touch roomy. Refer to the height / weight chart and order up if near the top of a size and choose carefully. Available in infant sizes 6 month to 24 months and toddler sizes 2, 3, and 4.